I’m not some hipster hockey fan. I'm not that cool. If Twitter were high school (and I’m not saying it isn’t) I would be sitting at the nerd table. I am a loyal Penguins fan. I do not hop on and off the bandwagon. In fact, I would likely be the one handing out instruments if such a wagon existed. “Cool” fans it seems, are negative... not so much by nature as by narrative. As a friend of mine is fond of saying, “It seems like you know what you’re talking about if you find a weak player and continually take a dump on him.” Cool fans are "I told you so" kind of people. They wait for someone to have a bad night then flood Twitter with "I told you so" Tweets. Take, for example; Pascal Dupuis. All the cool kids are up all bound up because they don't feel he belongs on the first line with Crosby. I believe that if an organization run by a legendary hockey hero and all around great human is willing to give him a chance to prove himself, who am I to question it? I’ve really taken the time to examine who I am when it comes to being a hockey fan. I discovered that I love the game itself. I love the rich history, the evolution and all the personalities along the way. I love the Penguins in particular. I’m enthralled by the stories of Mario playing through pain and am a shameless Crosby fangirl. I understand that while age and injury effects a player’s speed and skill inside beats the same heart he had when he was 22. I believe that the vantage point from your couch with replay, over-head cameras and slow motion is better than the on-ice official who had to peer around a mountain of a D-man to follow the puck. Therefore, you will always be able to argue with the referee. You will never be able to name the rule and recite it like he can. I accept that analytics are a part of the game. I’m working hard to understand them . I consider myself fortunate that I know people who are wicked smart at calculating stats both fancy and plain. Crosby’s “fancy stats” were fantastic this season and he walked away with the Trifecta of Trophies. However, I will bet on the man over stats every time. I don’t believe you have to be miserable to be a fan. Misery loves company and it spreads during a game like herpes in a fraternity. Penguin fans have not suffered like Sabre fans, for example, but at times you wouldn’t know that. The standards are high in Pittsburgh. I truly believe that if some fans could have executed Marc Andre Fleury at the end of last season’s playoffs they would have. Save your negativity for the other team. I know some great Flyers fans but I love to hate on Giroux. I was relieved when Max Talbot was traded because I didn’t have to hate him anymore. Who doesn’t enjoy hating on Ovechkin? I can hardly wait! 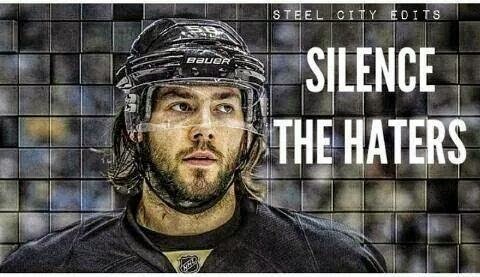 There's just no return in hating on Letang. What happened to the game being fun? What happened to it being YOUR team no matter how hard the 3rd period is to watch? What happened to pride? Sure, the last cup final the Pens went to was 2009 but at least they aren't the Blue Jackets. They acquired Scott Hartnell for the express purpose of irritating the Penguins and their fans. So, why not oblige them rather than hating on your own team? 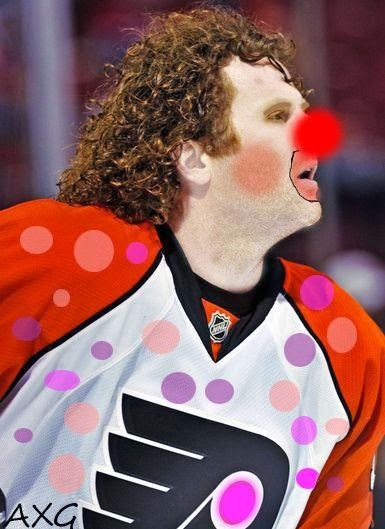 Save the hate for Hartnell! !